The purpose of Palmetto State Roots is to share some of what I have gained in researching my family history. My desire is to share with others my joy in the history of my home, the part that my ancestors took in forming that history, my love for Sumter and Clarendon Counties, my feelings for the place that I call Santee, as well as my pride for my home state of South Carolina. May we never forgot those who came before us. If not for them, where would we be, who would we be, or would we even be? One generation must not succeed the next without having an appreciation of who they are, what they are, and how they came to be. Having been born in the Palmetto State of South Carolina, I have always been aware of my Southern heritage. When I first began doing genealogical research, I was delighted to discover how deep my roots run into the history of my home state. Once I began to question my older relatives, I began to find that on both my sides of my family, my fore bearers have been in South Carolina and in Clarendon County for as long as anyone in my family could remember. When asked, no one seemed to know when the first members of our family came to Clarendon County or to South Carolina. Once I began to really dig deep into my family's history, I soon found that there would be few separate limbs. Since both of my parents were born in Clarendon County, and so were their parents, and so on down the line, soon on in my research, I came to realize that my family tree is actually a vine. Recently I described it as a vine of wisteria, winding in and out among the annals of time in Clarendon County, bare at times, but when it blooms, a glorious site to behold. The paternal and maternal sides of my family tree cross over one another so many times, that it makes my research a little easier than for those who have their roots spread out all over. With my research, I began to understand why I and other members of my family feel such a connection to the place we call Santee. Newcomers tend to ask,"Why do you call the lake Santee? Isn't its name Lake Marion?" Until I started doing genealogical research, I really hadn't given much thought as to why I call Lake Marion Santee. It was just a question that came up from time to time from folks who hadn't lived in the area long. I would just say to the person asking, "Well, that's just what we have always called it, Santee. "Eventually, after having lived here a while, everyone calls the Lake Marion, Santee. My family has spent many happy times at Santee, exploring the Fort Watson Indian Mound, boating, skiing, swimming, fishing, having family reunions, but we never talked about, or questioned why we didn't call the lake by the name on the road signs or on state maps. As a child, I never dreamed what an important roll Santee has played in my history. The Santee River was dammed long before I was born. Even my parents don't remember a time before the flow of river was stopped to create the huge lake that is so much a part of life in Clarendon and Sumter Counties and that extends to border with sections of Orangeburg and Calhoun Counties. But, my grandparents knew the river, and their grandparents knew it, and thus on back our ancestors knew the Santee as it once was. They knew the river with all of its creeks and streams: Jack's Creek, Wyboo, White Oak, Potato Creek, Church Branch, Taw Caw and so many more. They remembered and those place names live on today. When traveling by boat along the channel of the old river bed, I cannot begin to describe the feeling of awe that comes over me as I think about my ancestors and picture them traveling by boat in the exact same place, so many years, even centuries ago. I took this photograph between Williamsburg and Berkeley Counties. This scene is many miles south of the Santee River dam. Notice the color of the water. The Santee not a black water river like many others in South Carolina. 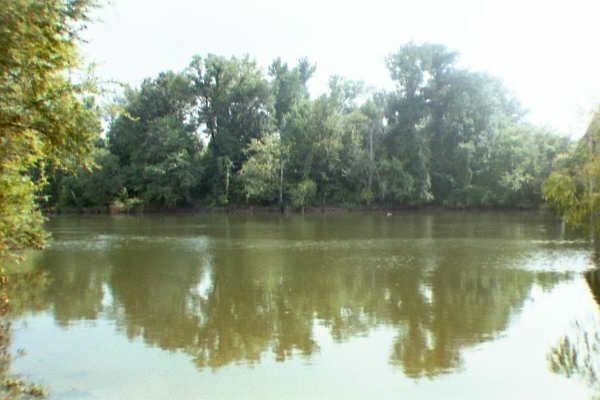 My Brunson ancestors traveled up the Santee River in 1740 to become the first settlers in this area. They lived on land that today is part of Poinsett State Park in Sumter County. Soon after, my ancestors the Richbourgs, the Holladays and so many others, used the old river to transport them to their new homes as well. They traveled inland via the Santee River at a time when the land along its banks was only a maze of sub tropical jungle. They came inland, up the Santee River into a wilderness, carved homesteads, farms, and plantations out of virgin forest and swamp land, raised their families, and when the time came, they shipped their goods back down the river, to the coast and on to the ports of Charleston and Georgetown. I've read that the yellow flow of the water from the Santee River can be seen three miles out into the Atlantic Ocean. There has always been a treacherous sandbar at the mouth of the Santee, which made the journey to Charleston dangerous, until the opening of the Santee Canal in 1800. The place that I know as Santee holds a special place in my heart, not just for happy memories of the times that I have spent there throughout my life, but even more so, because it is so much a part of my history and the history of the Old Sumter District and of Clarendon County. Now that I know so much more about the river's history, when ever I wade into Lake Marion and the water washes over me, I remember and I visualize the people the river brought home. The river was dammed up long before I was born, but I know it still. The Santee River holds a special place in my heart. I hope that there are others who have a special place, a place that has meaning for them in the way that Santee has meaning for me. They will be the ones who understand that feeling of history, of remembrance. Not everyone gets to feel that special feeling. When I think of Santee, I feel the history of the river; I see the Spanish moss hanging from the trees, smell the wisteria in bloom, and I can almost see my ancestors boating up that old river, coming home. The Santee brought them here. They lived and loved and died along its banks. They wouldn't recognize the old river if they came back today, but it's still there, hidden beneath the great waters of Lake Marion, and it lives in the hearts and minds of those who are their descendants. I am proud to be a part of the rich history and heritage of the Santee. to see my son,and his son, and the sons upon sons beyond. And their eyes were my eyes. As I felt, so they had felt and were to feel, as then,so now, as tomorrow and forever. Will of God, the Eternal Father." The earliest of my forbears to come to South Carolina were my French Huguenot ancestors. The first were my DuBose ancestors who settled along the Santee River in an area dubbed "French Santee," which is now in Berkeley County. They arrived in 1680. They were naturalized as English citizens in 1695/1696. An act of that year gave Huguenots and "other aliens, expect Papists "the rights of English citizens. Eventually, my DuBose ancestors moved across the Santee River to settle in Clarendon County. My Richbourg ancestors also settled in the French Santee area. The Reverend Claude Phillipe de Richbourge was a Huguenot minister who came to the New World, arriving in Virginia in 1700. He and a group of other French Protesters settled in Manakin Town, Powhatan County where they resided for about 12 years. In 1712 he and a party of other French protestants traveled from Virginia to North Carolina where they decided to live along the Trent River. They didn't stay in North Carolina long, because they were attacked by Indians and 111 of their fellow Huguenots were killed. Along with his wife, Ann Chastain, and others who survived the Indian massacre, de Richbourg and the other Huguenots left North Carolina to make their way to the more settled and secure, French Santee in South Carolina. de Richbourge served as the minister of the St. James Santee Church which was within sight of the Santee River in the village of Jamestown for several years until his death. In the years to come, his son, Claudius traveled inland via the Santee River to settle on land grants along Jack's Creek, a tributary of the river, in what would become Clarendon County. My Brunson ancestors made their way to Carolina from England via Connecticut. John Brunson and his wife, Frances Hills moved with their children from County Essex, England in 1635 with the first group of settlers in the Hartford, Connecticut area. Records show that by 1637, John had enlisted to fight in the Pequot War and for his service he obtained several parcels of land. By 1649, he and his family were living in Farmington, Connecticut. His son, John Brunson, Jr. moved to the Crown Colony of Carolina in 1692. He settled not far from the Ashley River, in what is now Dorchester County, where the village of Dorchester was founded by a group of Massachusetts, New England dissenters in about 1695. The land was not very productive so after about three generations, the village of Dorchester was deserted, and the dissenters moved on to Medway, Georgia. The Brunsons also left the area, but my line didn't go to Georgia. They stayed in South Carolina. In the year 1740, the grandson of John Brunson, Jr., Isaac Brunson, Jr. was the first to obtain a land grant in what is now Clarendon County. His family eventually settled along Jack's Creek, a tributary of the Santee River. Old land plats show that his wife owned land grants which covered parts of present day Poinsett State Park in Sumter County. The first of my Ridgeway ancestors is mentioned in the records of South Carolina in the year 1751. William Ridgeway petitioned for 200 acres of land in Kingston Township along the Waccamaw River. Kingston was named in honor of King George II, who ruled the British Empire at that time. It's now known as Conway and is in Horry County, not far from Myrtle Beach. At that time, new immigrants to the colony of South Carolina were offered a number of inducements if they chose to settle in Kingston or any of the other back country townships. The colonial government gave each new settler free transportation from Charleston to the township. Upon petition the settler would be awarded 50 acres of free land for himself and 50 acres for each member of his household. William Ridgeway's petition stated that he had lived in the area for several years on rented land and that he now wished to obtain his own property. He requested 200 acres for himself, his wife, and two children. The petition was granted. In a memorial made by his son, William Jr. years later, it shows that William Ridgeway, Sr. was able to obtain land located in what is now Clarendon County. This property was transferred in 1755 and was along the Santee River. Since William, Sr. must have moved with his family from Kingston, they may have traveled along the Wacammaw River to Winyah Bay in what is now Georgetown County and from there would have traveled inland to settle in Clarendon County. They may have sailed south along the coast of South Carolina to enter the treachorous mouth of the Santee River which forms the Georgetown and Charleston County border and then travled inland along the river through the French Santee and on to what was then the back country of Craven County. It is thought that the Ridgeways came to South Carolina from Virginia. It is well known that a great many settlers came to this area of South Carolina which would eventually become the Old Sumter District during the mid 18th century. The settlers came from Virginia and from other areas to the north. More than likely my Ridgeway line came from the New Jersey branch of the surname. The Virginia Ridgeways are connected with the New Jersey branch. I hope to the find the answer to that mystery of where my Ridgeway ancestors came from some day soon. for many of the graphics on my web site. to come by since December 29, 2008. Prior to that, there were over 100,00 visitors. Palmetto State Roots has been on-line since December 1996. Come back again. This page will be revised as often as possible. The data included on web pages created by Cynthia Ridgeway Parker may be freely used to further one's knowledge and understanding of personal family origins. The information included on these pages is from personal research and information and may not be republished or transferred in any form, neither electronically, nor printed. The information may not be used for any commercial purposes. Permission is granted to print hard copies for personal use. The above is a new email address as of Aug. 6, 2009. It is not linked in order to combat spammers. of my beloved daughter, Melissa Leigh Sutton.